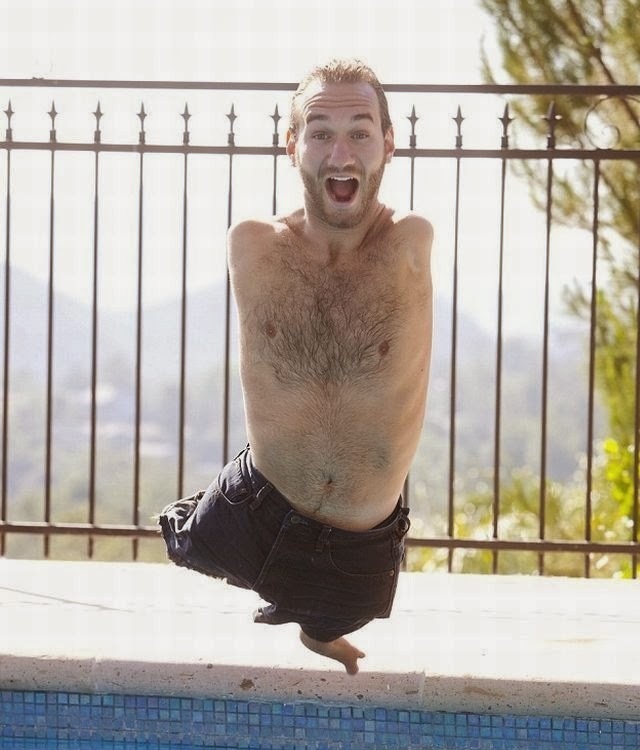 Nick Vujicic was born with no arms or legs in Brisbane, Australia. 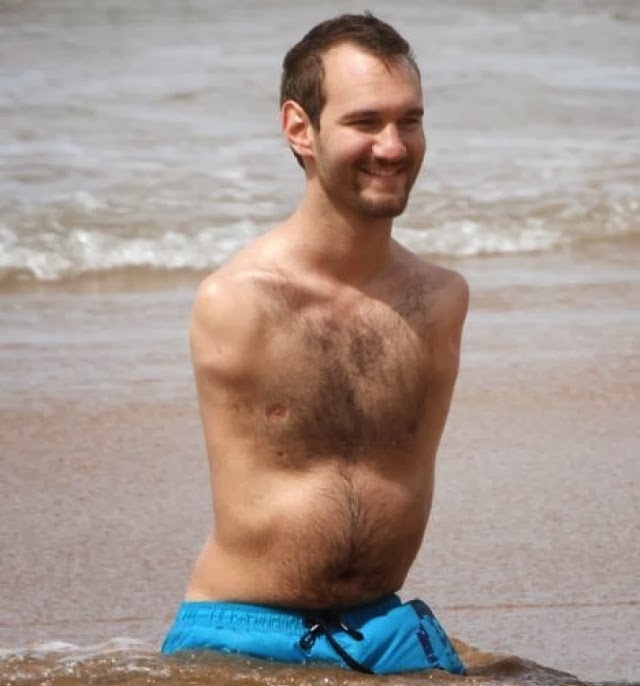 He plays football and golf, swims, and surfs, despite having no limbs. Nick has a small foot on his left hip which helps him balance and enables him to kick. He uses his one foot to type, write with a pen and pick things up between his toes. When Nick was born his father was so shocked he left the hospital room to vomit. His distraught mother couldn't bring herself to hold him until he was four months old. 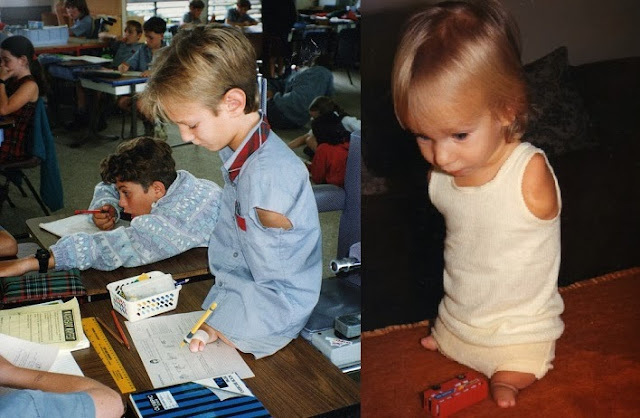 His disability came without any medical explanation - a rare occurrence called Phocomelia - and Nick and his parents spent many years asking why this cruel trick would happen to them. Despite the risk of bullying, his parents insisted Nick attended mainstream school and later he achieved a degree in Financial Planning and Real Estate. 'When I was 13 I read a newspaper article about a disabled man who had managed to achieve great things and help others. I realised why God had made us like this - to give hope to others. It was so inspirational to me that I decided to use my life to encourage other people and give them the courage that the article had given me. I decided to be thankful for what I do have, not get angry about what I don't' said Nick. He has travelled to over 24 countries speaking to groups of up to 110,000 people. In 1990 Nick won the Australian Young Citizen of the Year award for his bravery and perseverance. Nick began travelling the world and in 2008 he went to Hawaii and met surfing master Bethany Hamilton, who had her arm bitten off by a shark when she was 12. From her Nick quickly learned how to do three 360 degree spins on his board - a feat that got him on the cover of Surfer magazine within 48 hours.